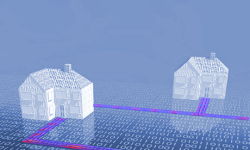 When you move house, moving your broadband may involve a period of time without internet access. This page aimed at how to place your order ensuring that downtime is kept to a minimum to get your broadband up and running as soon as possible	at	your new home. What is a Linked Order Reference Number (LORN)? What else do I need to know about SPO & LORN? To ensure minimum broadband time you must stress to your ISP that you wish to place a Simultaneous Provide Order. Simultaneous Provision is a method used by BT Wholesale to link together a PSTN and broadband order, to reduce both downtime and any lead time for adsl. It is not necessary for your telephone and broadband provider to be the same company, but both companies must place their orders using the same Linked Order Reference Number (LORN). You should give your service provider(s) as much notice as possible, ideally 3 weeks. The minimum lead time for broadband is 5 working days. Using the Simultaneous Provide Process also reduces the possibility of TAGs being left on the line from the previous owners ISP at your new address. A Linked Order Reference Number (LORN) is a unique reference order which links together your telephone (PSTN) order and your adsl broadband order in the BT Wholesale systems. It is vital that the LORN number is quoted and matched on both the PSTN and the broadband orders by your Service Provider. If you have a different supplier for your PSTN than your broadband, the first Provider should issue you with a LORN which you then give to the second supplier. It doesn't matter if you contact your ISP or phone provider first, as long as you pass the LORN on to your second contact. Use of a LORN ties together the new telephone order and the broadband order in the BTw systems allowing both the telephone and broadband to go live on the same day - as long as sufficient lead time has been given. What else do I need to know about SPO and LORN? Your Linked Order Reference Number is what matches the two orders in BT Wholesale systems so that the BT Openreach Engineer can wire your broadband connection on the same day as your new telephone goes live. Without a SPO & LORN you could be without broadband for up to a few weeks as an ISP cannot place an order for broadband until the PSTN changes have taken effect and updated on all systems, then add on the minimum lead time for adsl of 5 working days, you can see why sometimes this process could take several weeks if not done correctly. Linked Order Reference Numbers should also be used when migrating between Full LLU services. Failure to use the SPO process correctly by the likes of Sky and TalkTalk is why some of their customers have long periods (several weeks) of downtime without broadband. BT Wholesale DSL disconnection cost on the old property - £24.74 + VAT. BT Wholesale DSL new connection cost on the new property. - £39.79 + VAT. Plus any BT Wholesale charges in relation to your telephone line rental. This may vary depending upon the service already available at your new house. Your ISP may be prepared to subsidise some or all of these costs if you stay with them for a period of time, for example some ISPs will subsidise one free house move per year. The following information has been written by Kayak after his experiences of moving house and his adsl connection. Reproduced with his kind permission. Simultaneous PSTN/ADSL Provide Orders (SPO for short here) are intended to allow you to move house without a break in service. If you try to carry out the move any other way then there will be a break in service since your ISP will need to wait until the new line is connected before ordering ADSL on it. They will also work if you order a new line with ADSL at your existing address. The orders however are fairly complex and prone to error on the part of BT and/or the ISP. Hopefully these instructions will help others to avoid the experience I went through. When you ring BT 150, you are speaking to BT Retail, who can set up BT's end of the order (the PSTN end) and flag it as an SPO. When you ring your ISP, they can set up their end of the order (the ADSL end) and flag it as an SPO. Both BT and the ISP need to inform BT Wholesale, who provide the ADSL kit in the exchange, but the two orders need to be tied together with a reference number. This reference number will be either BT's order number or the ISP's, depending on which you ring first. You can ring BT first or the ISP first and they will give you their reference number to give to the other. First of all ask your ISP which way around they want you to do it as they will be used to one way rather than the other (if you're unlucky they'll be used to neither way). If your ISP ask you to ring BT first, ring 150 and ensure that at the very beginning of the conversation you ask to place a simultaneous order for the provision of a phone line with broadband (when they enter the order they need to select the correct option at the beginning, and if you mention it later they will either start again or ignore your request). Obviously you will also need to tell them whether you are moving home, i.e. ceasing your existing connection at the same time. BT will ask you for the name of your ISP and will check that it accepts SPOs. They will then ask you whether you have a reference number from the ISP. Even if you have been given a reference number by your ISP, DO NOT give it at this point or the whole thing will fail. This is because if BT are given a reference number, their system will assume that the ISP has already set up an order with BT Wholesale and will not set one up. After they have taken you through the PSTN order, they will give you an order number. Before you ring off, ask them to double-check that the detail of the order specifies the simultaneous provision of an ADSL service. If they can't see it in the detail of the order, it isn't there and they need to cancel the move and start again. You can and should also look up the order number on BT's web site, http://www.bt.com/business/ordertracking , preferably while you're on the phone to BT. (If you don't have an account at BT.com, register by going to http://www.bt.com and clicking on "At home" and then "Register Now"). When you display the detail of the order it should say 'BB/PSTN SIM PROVIDE' amongst the items listed. Then go to your ISP with the BT order number and place the ADSL order with them. They will key the BT order number into a system provided by BT Wholesale to check it, and they will then place their own order with BT Wholesale, tying it into the BT part of the order using the BT order number. If your ISP decide to take your order first, give them all the details and they will give you their reference number to pass to BT. If you have a ticket type system showing the progress of the order, check that they have sent an ADSL order to BT Wholesale before you ring BT. The BT Wholesale order number will be in the form 1-xxxxxx where x is alphanumeric and may appear on the ticket, but is not the one to pass to BT. Then ring BT 150 and ensure that at the very beginning of the conversation you ask to place a simultaneous order for the provision of a phone line with broadband (when they enter the order they need to select the correct option at the beginning, and if you mention it later they will either start again or ignore your request). Obviously you will also need to tell them whether you are moving home, i.e. ceasing your existing connection at the same time. BT will ask you for the name of your ISP and will check that it accepts SPOs. They will then ask you whether you have a reference number from the ISP. ENSURE THAT YOU GIVE IT at this point or the whole thing will fail. If you start talking about the detail of the PSTN order and realise that you have not given the reference number, it is too late and you will need to get BT to start again. If you have a ticketing system, check that the two ends appear to have been tied together, otherwise ask by telephone. Some of the tying together might happen overnight.